Be the first to share your favorite memory, photo or story of Novella. This memorial page is dedicated for family, friends and future generations to celebrate the life of their loved one. 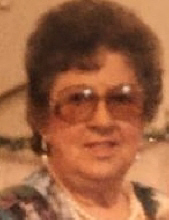 Novella G. Droit, 95, of Thompsonville, Illinois, passed away Thursday February 7, 2019 in Stonebridge Nursing and Rehab – Benton, Illinois at 9:30p.m. Novella was born March 21, 1923 in Harco, Illinois to George and Margaret (Libby) Shriver. She was a member of Mt. Zion Freewill Baptist Church – Thompsonville, Illinois and Eastern Star. Novella loved her family, birds, flowers, gardening, travelling, and reading. She was preceded in death by her husband, Howard Droit on June 8, 2009; parents; brothers: George and Charles “Ozzie” Shriver. Novella is survived by her sons: Danny (Barbara) Droit of Thompsonville; Bruce (Stacee) Droit of West Frankfort; daughter, Marsha (David) Wright of Benton; sister, Phyllis (Don) Gibson of Staunton, Illinois; four grandchildren: Stephanie (Heath) Lasswell, Marilyn (Steve) Cima, Sara (Jeff) Van Horn, Julie (James) Giacone; eight great grandchildren. Funeral services will be at 2:00p.m. on Sunday February 10, 2019 in Union Funeral Home – West Frankfort, Illinois with Minister Randy Carney officiating. Burial will be in Mt. Zion Cemetery – Thompsonville, Illinois. Visitation will be held from 12:00-2:00p.m. at the funeral home prior to the service. Memorials may be made to Mt. Zion Freewill Baptist Church – Thompsonville, Illinois and will be accepted at the funeral home. To send flowers or a remembrance gift to the family of Novella G. Droit, please visit our Tribute Store. "Email Address" would like to share the life celebration of Novella G. Droit. Click on the "link" to go to share a favorite memory or leave a condolence message for the family.